Each picture is labelled with its English name, Spanish name and a simple guide to pronouncing the Spanish word(s). There are alphabetical Spanish-English and English-Spanish word lists at the back of the book. 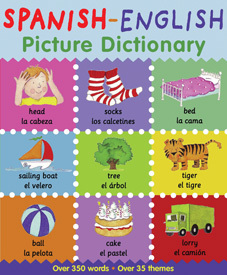 Spanish -English Picture Dictionary is suitable for early language learning. Although mainly aimed at English-speaking children who are learning Spanish, it would also be suitable for Spanish-speaking children who are learning English.